Whether for managed print services, document security, digital signage or how we're helping to preserve the environment, Toshiba is always making headlines. Toshiba America Business Solutions today introduces the addition of five new e-STUDIO™ series to its multifunction printers (MFPs) line. 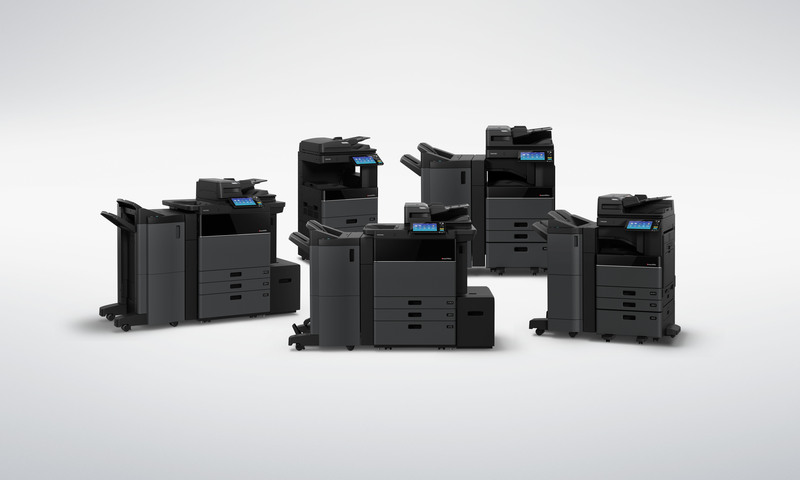 The new MFP lineup includes three color MFP series (13 models) and two monochrome series (10 models) all of which will ship by this summer. The MFPs blend a newly-engineered feature set to address the print, document management and workflow needs of virtually any business application. The new software and hardware elements, which include Intel’s® new processor, a customizable tablet-style user interface (UI), Embedded Application Platform and Dual-Scan Document Feeder (DSDF) highlight Toshiba’s innovative product portfolio. All of the features are designed to help organizations operate more efficiently and cost effectively while improving workflow. Multitasking and handling complex tasks like embedded optical character recognition (OCR) applications are also simpler with the inclusion of the powerful multi-core Intel® Atom™ processor. The Embedded Application Platform makes it possible for the MFPs to easily use embedded or third-party applications and connect to the cloud enabling mobile users to work anywhere. Toshiba’s 9-inch tablet-style UI facilitates a more intuitive user experience. The latest e-BRIDGE™ Next controller, working in concert with the UI, provides the flexibility to accommodate any user’s unique workflow needs. "Our latest e-STUDIO line represents our most innovative and intuitive MFPs to date," said Bill Melo, Toshiba America Business Solutions chief marketing executive. "Understanding that every industry has unique needs, we integrated state-of-the-art and customizable technology into our new MFP line to meet the complex demands of today’s business users." The e-BRIDGE controller’s color profile tool allows for the creation of profiles to adjust color for varying media types, lighting or to match specific Pantone colors. The DSDF helps users complete even the most challenging of projects by delivering up to 240 images per minute while holding as many as 300 sheets at a time. Toshiba’s advanced e-STUDIO models feature a more durable and reliable engine to maximize uptime and reduce the total cost of ownership. A new sophisticated black matte look completes the new products innovative design while complementing even the most contemporary of business settings. Toshiba’s latest MFPs additionally reflect its commitment to a more sustainable planet. The company’s 23 new products all meet the stringent criteria of major environmental programs and standards, such as EPEAT® Gold, Restriction of Hazardous Substances (or RoHS) and ENERGY STAR®. Toshiba’s new e-STUDIO products starts at $5,339 and will all be available this summer through the company’s authorized dealers. For more information about Toshiba products, or to locate an authorized Toshiba dealer in your area, visit www.business.toshiba.com. TABS is comprised of five divisions: the Electronic Imaging Division; the Toner Products Division; the Document Solutions Engineering Division; the International Division; and Toshiba Business Solutions.